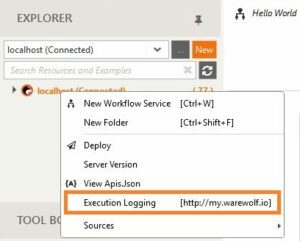 The Execution log is a record of the action steps or events executed in a workflow or service in Warewolf. Events are recorded in the sequence in which they occur and can be filtered by URL, user, execution time, execution start date, execution completed date, success or error. You can see the result of an execution and re-run an execution using the same parameter values. To access the Execution Logging, right click on the server name in which you want to access the server log files for and then click on Execution Logging in the context menu. Your default browser will open my.warewolf.io/executionlogging/server=localhost. Depending on your security setting you might need to add in your user credentials. We strongly suggest you set your default browser to chrome for maximum performance. if Warewolf cannot connect to a server or an error occurs, it will automatically revert to your localhost. You can filter your executions or workflows through various filtering options on the web page. You can search for an executed workflow, resource or service by name. By typing the name into the URL filter box a list will appear. In the example below we are searching for the Select and Apply workflow. You can filter the duration of the execution to see how long the execution took. This is measured in milliseconds. You can filter by the status of an execution. If the execution is successful, the execution status will show Success and if it fails, it will show Error. This feature allows us to quickly eliminate the successful executions if we are searching for a failed execution and vice versa. If we know the date and time that the workflow or service was scheduled to run, we can filter using these to find our execution. If we click on start time, a calendar will appear where you can select the date and time. To filter by completed time, click on the completed time and the calendar will appear. You can now select the date and time in which the execution completed. You can search for executions made by another user on your server. You can search for them by name in the User Filter. Click Clear to reset the filters. You can also sort your events from ascending or descending by clicking on each tab header. You can execute your service again by clicking on the URL. A message box will appear, click OK to execute the process again. This will also execute all your sub-workflows related to this workflow. The service will now execute in your browser. To see the result of an execution, you can click on the ellipses in the Result Field […]. The result dialog box will appear showing the result of the execution.